Kim Lasecki, Ph.D., is a very experienced runner and high school cross country coach. He ran high school track and cross country for Stevens Point Area Senior High (SPASH) as a member of two state championship teams for cross country in 1981 and 1983 as well as two state runner-up teams (by a single point each year) in 1982 and 1984. He was a several time conference and sectional champion. Kim was also a member of the WIAA all-state track and cross country teams during his senior year. His fastest times in high school included a 9:19 two mile and 31:58 10K at the Bellin Run during his junior year of high school which is the second fastest high school time ever run in its 35 year history. In high school, Coach Lasecki finished 3rd at the National TFA USA Track and Field Championships held in Baton Rouge, LA. He also won the special invitational 2 mile high school race held at the University of Wisconsin during his senior year. Coach Lasecki also ran collegiate track and cross country at both Marquette University and the University of Wisconsin Stevens Point. At UWSP, he was a Division III All-American in the 10,000 meter for Track and Field. He ran a sub 4:10 indoor mile in college and was named most outstanding frosh at Marquette and MVP of his team in 1985 and 1987. While at Marquette, Coach Lasecki’s best collegiate cross country performance was at the National Catholic Cross Country Invitational held at University of Notre Dame where he took 7th overall. Currently, Coach Lasecki enjoys running and remaining competitive in road races locally, nationally, and abroad. 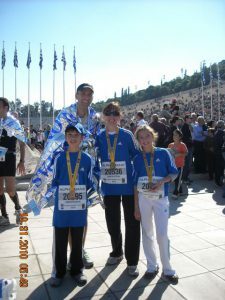 He has completed more than ten marathons including races at the Chicago Marathon, Disney Marathon, Boston Marathon, and recently the Athens Marathon in Greece. He has won the master’s division of the Cellcom Half Marathon twice and this spring ran 2:41 as his master’s personal best at Grandma’s Marathon in Duluth. Dr. Lasecki has also had tremendous opportunities to coach several teams prior to joining the NDA staff. Previously, he was the head cross country coach of Wisconsin Rapids Lincoln High School in 1990 and was named Wisconsin Cross Country Coaches Association District Coach of the year after his team took 4th at the WIAA state meet. He also was assistant coach, thereafter, for two years at Fennimore High School under head coach, Vince Lease. During those years, the Fennimore boys won the state title and took second in 1991 and 1992, respectively. Currently, Dr. Lasecki is employed as a clinical psychologist for Bellin Hospital where he has proudly worked for nearly 15 years. He received his doctorate degree in psychology from the University of Utah. Coach Lasecki is married to his wife, Cynthia, who works as a physician for Bellin Health. He and his wife have been married for nearly 19 years and have twin children, Nicholas and Elisabeth, who are currently attending high school at NDA.